1 - The activities are in reverse order by date, (latest at the top) but we sometimes add pages a couple of months after the event. 2 - There are more pictures and articles from our activities in the Newsletter pages. 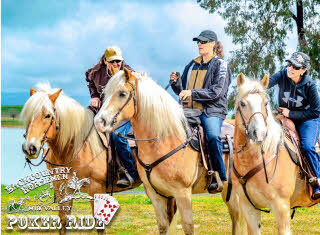 We had a Poker Ride at Woodward Reservoir on March 23, 2019. See more, with 12 pictures (750 KB). 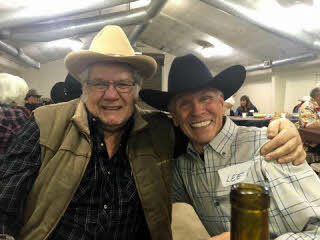 We had our annual Winter Roundup on January 5, 2019, with food, fun and music. See more, with 20 pictures (392 KB). 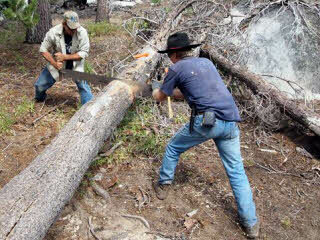 Four of us cleared trees from the Coyote Trailhead while keeping an eye out for the Donnell wild fire. August 6 and 7, 2018. See more, with two pictures (170 KB). 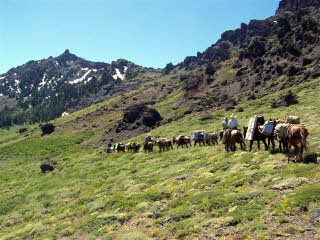 We tught 8 lucky youths the basics of LNT (Leave No Trace) packing and camping in the Sierra Nevada, June 22 - 24, 2018. See more, with a page of pictures (890 KB). 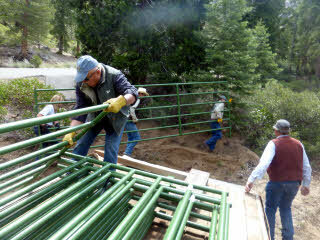 Three of our guys spent two days fixing the water trough at Kerrick Corrals, June 22 - 23, 2018. See more, with two pictures (110 KB). 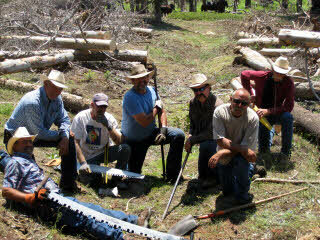 A dozen of us spent three days clearing trails around the Clark Fork campground in the Carson-Iceburg Wilderness area. See more, with a page of pictures (627 KB). 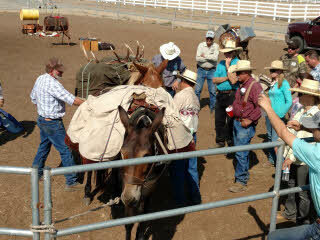 Our team won the Mule Packing Competition at the annual Mule Days fair and exhibition in Bishop, California over the Memorial Day weekend this year. See more, with a page of pictures (475 KB). 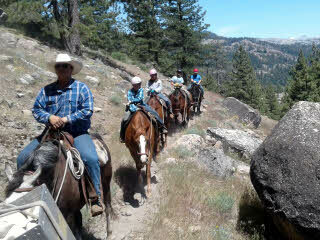 We camped out at the Rumsey's Mother Lode Ranch to do a little unit business, socialize, ride and give the kids a fun weekend. See more, with a page of pictures (475 KB). 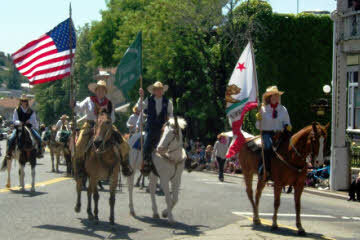 We rode in the parade for the Oakdale Rodeo on April 14, 2018. See more, with a page of pictures (1.1MB). 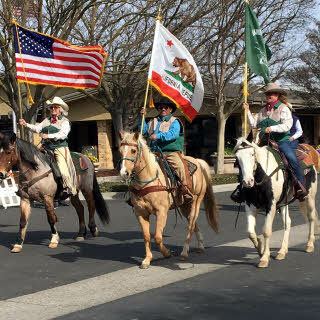 We rode in the parade for the Ripon Almond Blassom Festival on February 24, 2018. Read more, with a page of pictures (900 KB). 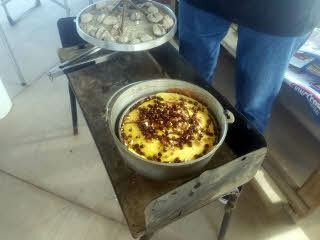 The Dutch Oven Group, which spands multiple generations, got together to share food and recepies at Carl Perry's ranch. 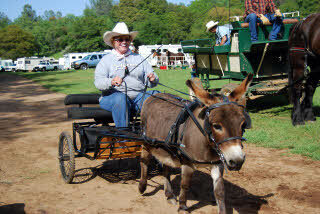 Read more, with a page of pictures (518 KB). We got together to eat, drink and elect officers for the year. Read more, with a page of pictures (491 KB). 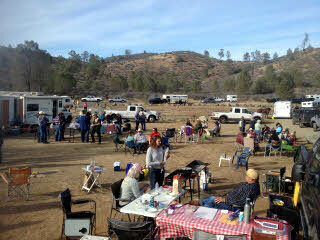 We had what is becoming an annual potluck and ride at Red Hills on New Year's Day. Read more, with a page of pictures (186 KB). We held a Pack Clinic at Modesto Junior College, for beginners and experienced packers alike. Read more, with a page of pictures (230 KB). 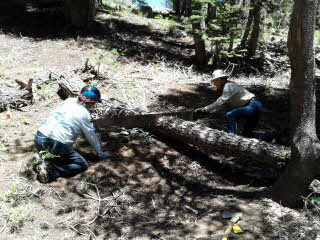 We cleared over 100 trees off the trails out of Coffin Hollow. Read more, with a page of pictures (632 KB). 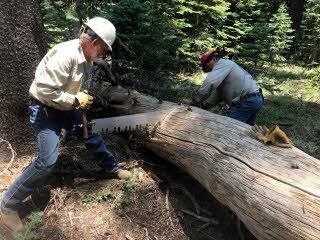 We cleared quite a bit of downed timber off the trails out of Clark Fork Horse Camp. Read more, with a page of pictures (528 KB). 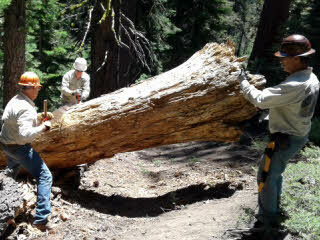 Four of us re-certified on the cross-cut and chain saw. Saftey first! Read more, with a page of pictures (169 KB). We introduced 12 young women to packing, the principles of LNT (Leave No Trace), and we saw some wonderful mountain lakes. 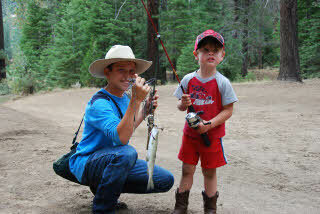 Read more, with a page of pictures (912 KB). In what is becoming an annual event, we celebrated the New year at Red Hills with a potluck that featured deep-fried turkeys, and then rode them off. Read more, with 8 pictures (581 KB). 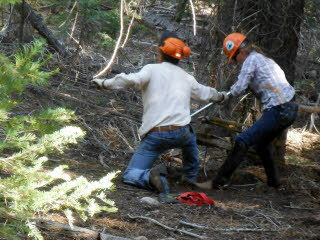 Over 28 BCHC Mid Valley Unit members got together to clear 19 miles of trail along Clark Fork on July 12 -14, 2014 Read more, with 5 pictures (484 KB). 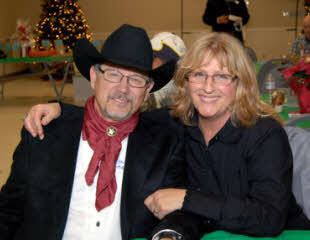 Randy Rasmussen, BCHA Advisor for Public Lands and Recreation, appeared on Equestrian Legacy Radio. You can hear him and the music of Templeton Thomas here: Equestrian Legacy Radio Templeton Thompson's music is lovely, but if you're short on time, scroll to minute 52:15 for the start of the BCHA interview. He responded to two callers from Missouri (not members of Show-Me BCH) who took issue with Show-Me BCH's response to a recent NPS plan for the Ozark National Scenic Riverway. 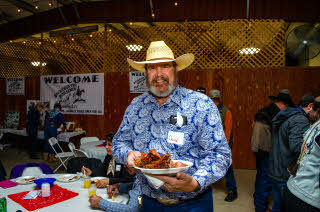 109 of us had a wonderful time at Don and Laurel Rumsey's Mother Lode Ranch. 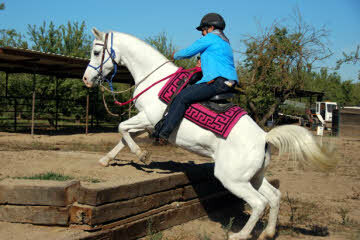 Rides, clinics, good food, good times. Read more, with a page of pictures (1.4 MB). We combined business with pleasure on Saturday, December 15, with a gala dinner dance, fund-raising raffle and general meeting to elect seven new board members. Read more, with a page of pictures (554 KB). 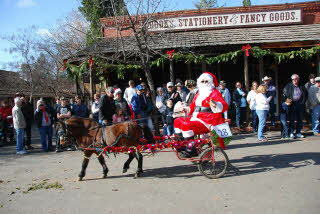 We rode, and helped out behind the scenes, at the annual Columbia State Park All Equestrian Christmas Parade on December 9, 2012. Read more, with a page of pictures (900 KB). The BCHC Mid Valley Unit Dutch Oven Group demonstrated their considerable skills at Crescent Outdoor Supply, November 10, 2012. Read more, with a page of pictures (850 KB). 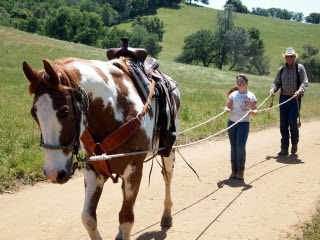 We rode through simulated tunnels and across simulated bridges at a trail challenge on November 3, 2011, at the Diamond Bar Arena in Ceres. Read more, with a page of pictures (660 KB). 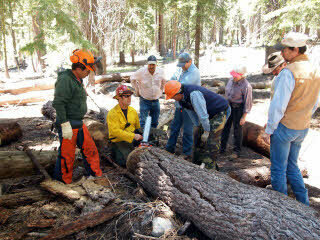 We had a general meeting at Kennedy Meadows August 31 - September 5, 2012. 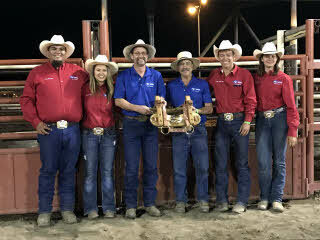 A little business, a little education, lots of food and riding. Read more, with two pages of pictures (440 KB each). 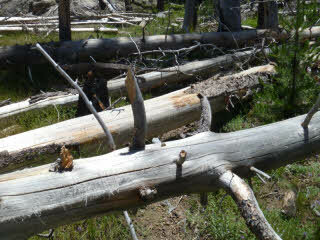 We cleared the trail to Kibbie Ridge on two weekends in August. Read more, with two page of pictures (900 KB each). 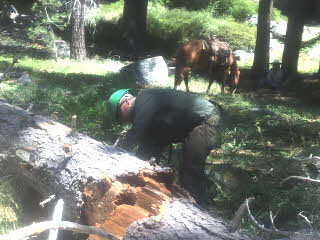 We cleared some trails out of Pine Valley Horse Camp over the Fourth of July weekend in 2012. Read more, with a page of pictures (229 KB). 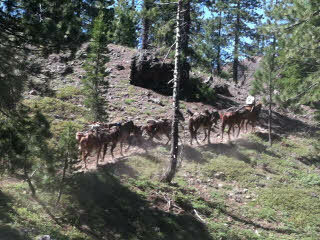 We cleared more than 60 trees along the trails from the Clark Fork Horse Camp on June 23 - 26, 2012. 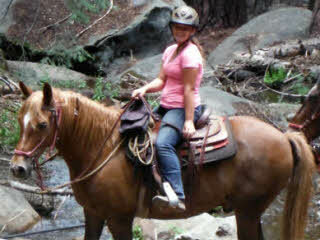 When we were finished you could ride unobstructed for two hours up the river, and an hour down. Read more, with a page of pictures (930 KB). 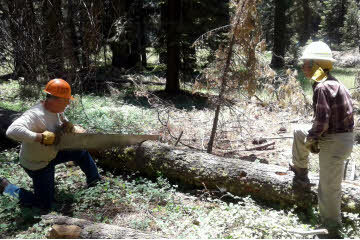 Nine of us took a class on chain saw use and safety from the USFS on June 9 - 11, 2012. Read more, with a page of pictures (855 KB). 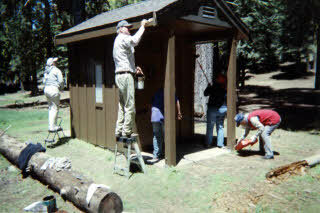 We cleaned up and painted at Kerrick Corral and Pine Valley Horse Camp on June 6, 2012. Just another public service project by the volunteers of BCHC. Read more, with a page of pictures (134 KB). 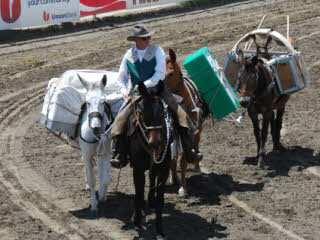 We were named "Best Friend of the Packers" at the Bishop Mule Days over the Memorial Day weekend in 2012. Read more, with a page of pictures (855 KB). 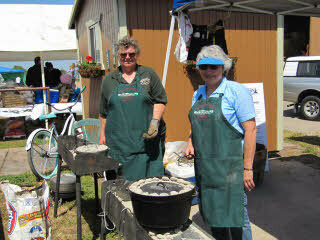 About 15 of us came to demonstrate the fine art of Dutch Oven Cooking to the general public. 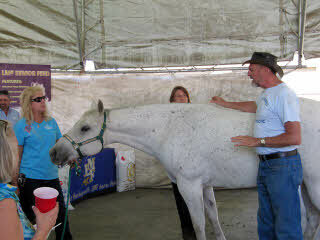 We held this one at Crescent Work and Outdoor Supply, in Modesto. Read more, with a page of pictures (249 KB). 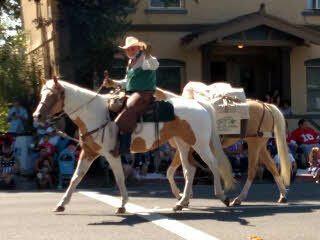 We rode in the Mother Lode Parade, in Sonora, May 12, 2012 Read more, with a page of pictures (574 KB). 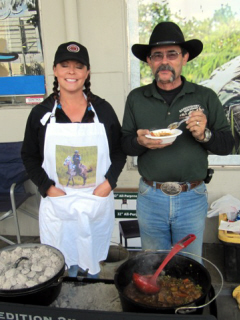 We "showed the flag" - Dutch Oven demo, packing demo, calendar sales - at the tack swap put on by ReHorse, a horse rescue organization, on May 5, 2012. Read more, with a page of pictures (305 KB). 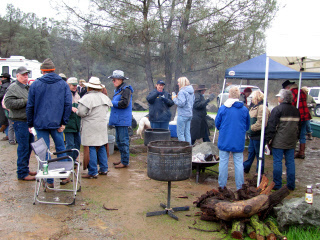 We had a ball - and a general meeting, and a lot of good food - camping out at the Rumsey's Mother Lode Ranch on April 27, 28 and 29, 2012. Read more, with two page of pictures (700 KB each). 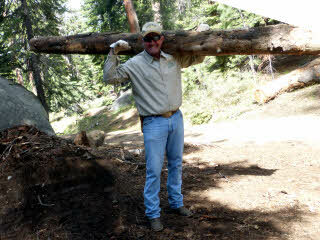 We packed the Pacific Crest Trail Association's gear out for them, from Ebbett's Pass. See a page of pictures (2.3 MB). 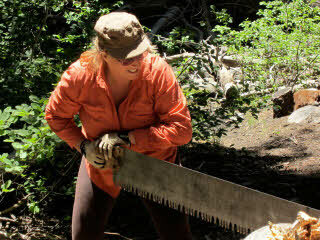 We spent three days clearing fallen trees from the Kibbie Ridge trail, using cross-cut saws and a griphoist. 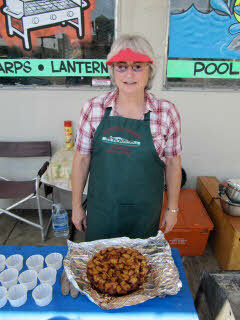 See a page of pictures and read the newsletter article. (3.1 MB). 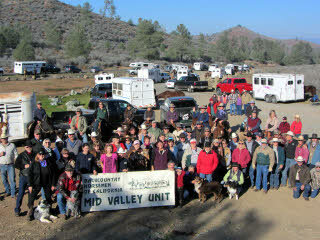 We had our annual ride, potluck and deep-fried turkey extravaganza at the Red Hills riding area January 1, 2011. See a page of pictures (495 KB).